I’m sure it happens to everyone who keeps a blog at some point, you want to write a post but find yourself at a loss for something to say. Your regular weekly post doesn’t appear and you let it slide for awhile while you try to conjure something interesting to write. Before you know it its been three weeks since your last post and suddenly you’re haemorrhaging readers. Fear not if this scenario is all too similar to you, help is at hand. 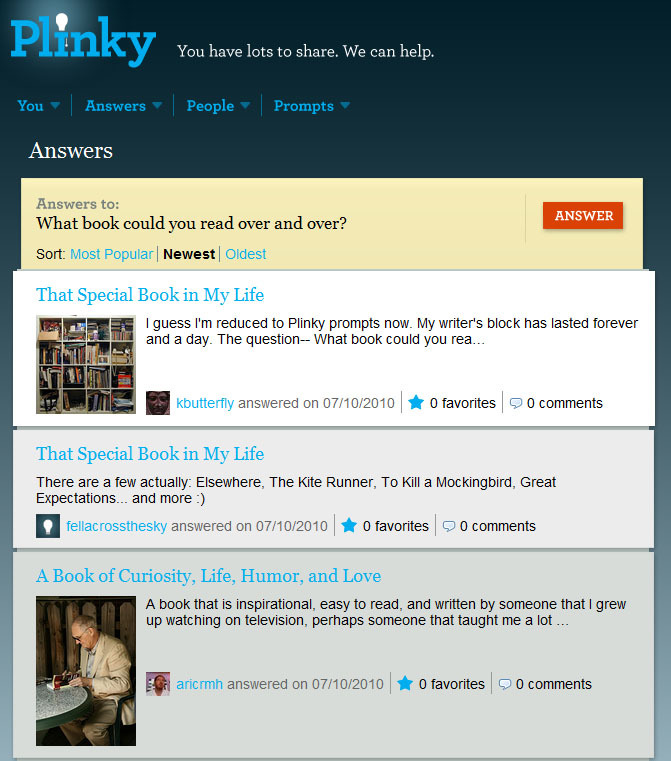 Plinky is a service that provides you with daily prompts, to answer questions like the one above, that you can spin out and develop in to a post for your blog. The prompts themselves are suggestions from the network of users which makes the end result feel almost like a large crowdsourced blog post. The service also show’s all the other blog posts that people made from each prompt which makes for fascinating reading. It always amazes me at how many different responses you can get to the same question. Never being one to miss an opportunity for shameless self promotion, this function is also a great way for other like minded people to discover your blog. If you live and die by your weekly traffic figures it might be worth giving Plinky a try just to be featured on their answers page. 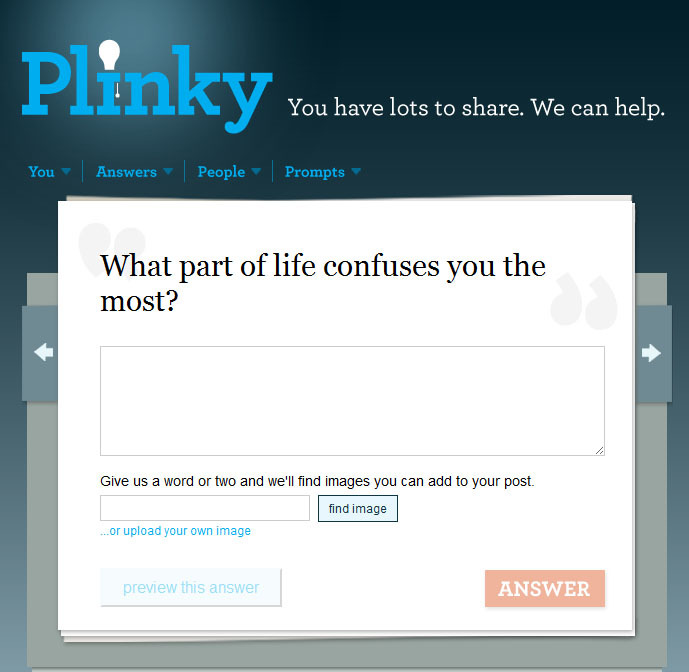 Once you have your answer written Plinky also help you find pictures, add an introduction and come up with a title so your answer becomes more like a blog post. The great news is that Plinky also works as a plugin with WordPress, so if you have a WordPress blog you can publish your shiny new post straight to your account. This means even the inherently lazy have no excuse not to be blogging as Plinky have made it as easy as possible to create and post. The only draw back is that this service wont really work on purely professional or business blogs as a post on “something you lost and want back” doesn’t really belong there. However Plinky is a relatively new service (it’s just become part of Automattic) so it’s worth keeping an eye on for future developments. What do you think of Plinky? Would you consider using the service and can you think of any great prompts for everyone to write about? What a great idea, will be checking it out for some inspiration, thanks for writing it up! Kelly – what a great find.